New imaging potential: standard resolution (left) compared to (centre, right) high resolution and superresolution obtained with the chip-based technique. CREDIT: Bielefeld University/Robin Diekmann. A photonic chip that enables superresolution light microscopy - or ‘nanoscopy’ - to be achieved by using traditional microscopes has been developed by physicists at Bielefeld University and The Arctic University of Norway in Tromsø. In the case of nanoscopy, single fluorescent molecules’ position can be ascertained at an accuracy of a few nanometres - or one-millionth of a millimeter. The position information can be applied for generating images at a resolution of nearly 20-30 nm, that is, 10 times that of traditional light microscopy. To date, this technique has mandated the use of exclusive, high-cost instruments. Bielefeld University and the University of Tromsø have together filed a patent for the innovative ‘chip-based nanoscopy’ process. The research was published in the Nature Photonics journal on 24 April 2017. The innovative photonic waveguide chip was invented by Dr. Mark Schüttpelz from Bielefeld University and Dr. Balpreet Singh Ahluwalia from the University of Tromsø. Professor Dr. Thomas Huser and Robin Diekmann from the Biomolecular Photonics Group at Bielefeld University also contributed in advancing the innovative concept. The concept enables experiments to be carried out in a very simple manner - a chip measuring the size of a specimen slide is directly illuminated by means of a probe. The signal perpendicular to the chip is recorder by using a lens and a camera. The acquired measurement data can be rebuilt as superresolved images at a strikingly higher resolution when compared to the data acquired by means of traditional microscopy. In comparison to images simultaneously acquired by means of conventional nanoscopy methods, which range from just parts of cells to a few cells, the application of photonic chips enables visualization of over 50 cells in a single superresolution image. 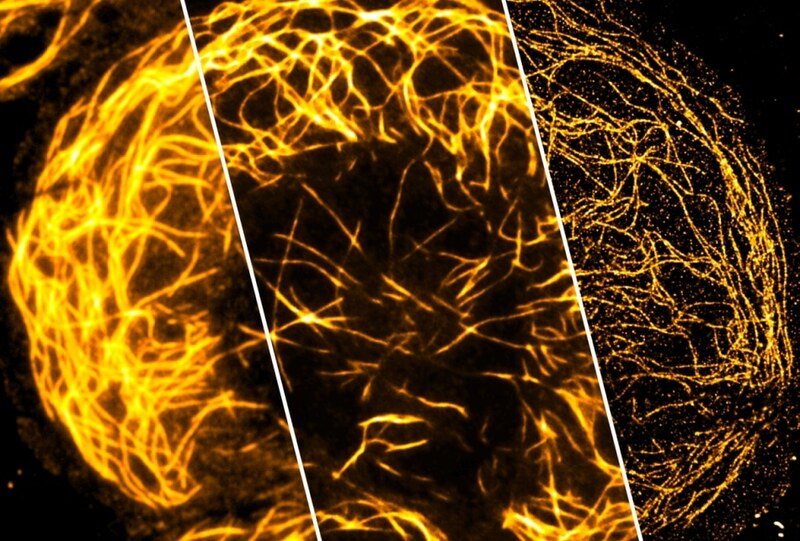 The invention of the new chip-based superresolution technique is a paradigm shift in microscopy, and it will now permit a much broader use of nanoscopy in science, research, and everyday applications. Prevalent nanoscopic methods are very costly, highly complex, and mandate thoroughly trained specialists. Till date, these disadvantages have limited the application of nanoscopy to just a few specialized institutes globally, inhibiting its proliferation to standard laboratories in medicine and biology as well as to analytical laboratories and hospitals. Galileo Galilei invented light microscopy in the year 1609. In the year 1873, Ernst Abbe found out the basic characteristic that restricts an optical system’s resolution for visible light to approximately 250 nm. To resolve the diffraction limit of light, various optical techniques have been invented in the past few years. The Nobel Prize for Chemistry for the year 2014 was awarded for developing a superresolution in the range of approximately 20-30 nm.